14 THE DOCTRINE OF CHANCES. how many tickets a person ought to take to make it an equal chance for one or more prizes. Multiply 39 by 0.7, and the product will show you that the number of tickets requisite to that effect will be 27 or 28 at most. 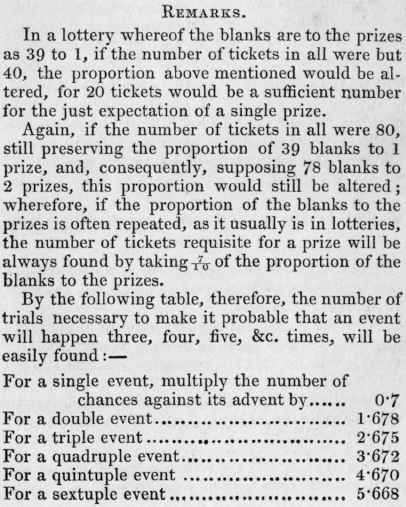 Likewise, in a lottery whereof the number of blanks is to the number of prizes as 5 to 1, multiply 5 by 0.7, and the product 3.5 will show that there is more than an equality of chance in four tickets for one or more prizes, but less than an equality in three.